★Shimmering flat cable chain, 14kt gold fill or sterling silver. Single strand as a necklace, double strand as a bracelet. 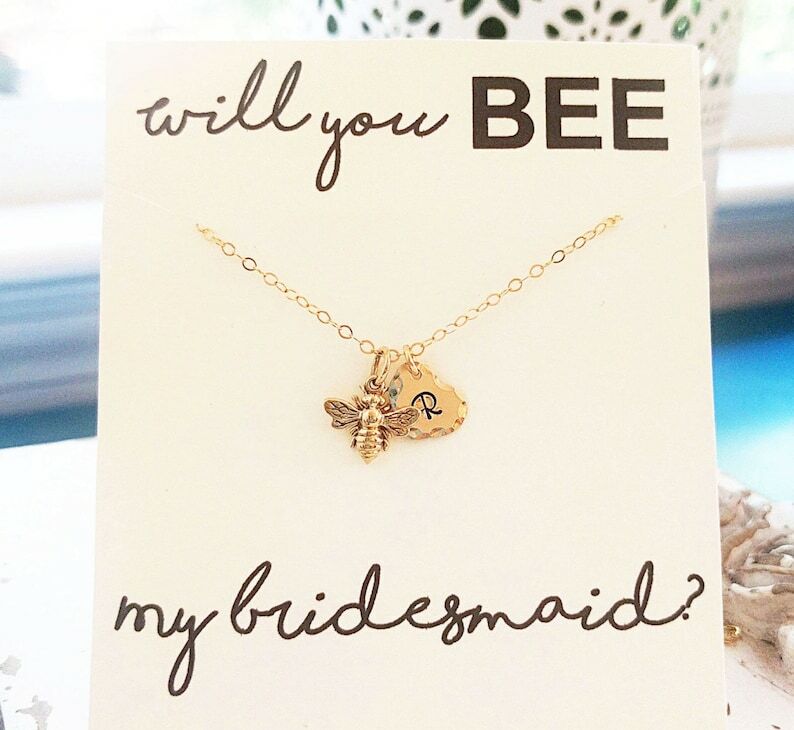 ★Petite Bee Charm (10mm) - Solid Bronze or Sterling Silver. ★Hand hammered initial heart (9.5mm), 14kt Gold Fill or Sterling Silver. ★Please see the very last photo for my font choices (pictured with the uppercase script font). ►Please be sure to include your personalization choice(s) in the "message to BijouxbyMeg" box in your Etsy shopping cart!!! Please do not hesitate to message with any questions regarding the customization details! Honey Bee Bracelet, Gold Initial Charm Bracelet, Personalized Jewelry, Hand Stamped Jewelry, Gold Bee Bracelet, Will you BEE my bridesmaid? Wow! When I opened the package, it was everything I expected and WAY more! Each bracelet was in it's own box, with a ribbon around it, and a sticker on the outside of what was inside. Meg even wrote me a handwritten note congratulating me on my upcoming wedding. It was such a great personal touch!! The bracelet is very good quality too. I HIGHLY recommend this product! They were all perfect!!!! I love them so much! !